Happy Sunday everyone!! Also, Happy Easter Sunday to everyone!! We have the PERFECT theme for such a great holiday. Citrus Fruits!! Any and all Citrus fruit recipes here guys. March 31st is National Oranges and Lemon’s Day!! This awesome theme is being hosted by the fabulous Jen over at Junaita’s Cocina!! I’ve been MIA the past few #SundaySuppers, I’m so sorry…….I’ve been under the weather and really using the time to rest, OK well I had no choice, I couldn’t function 🙂 But I’m baaaaaaaaaaaaack! So lets celebrate by enjoying all of these wonderful Citrus Fruit Recipes!! When choosing a recipe I wanted to try a dessert because I absolutely love anything and everything Lemon!!! I’ve never made anything cheese cake, so I thought this was a good first attempt! Don’t forget to scroll down and see what the other #SundaySupper members have brought to the table this week!! Have a wonderful Sunday Friends! Line 12 muffin tins with muffin liners. Process graham crackers in a food processor until finely crushed. In a small bowl combine the graham cracker crumbs and sugar. Add melted butter until it's incorporated. 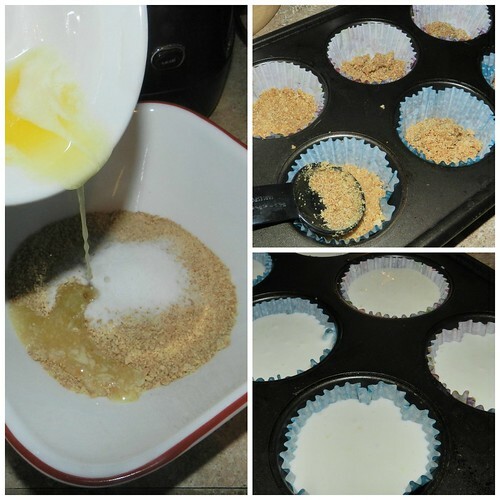 Add the mixture to the bottom of each muffin liner. Crush each one down as much as possible using a spoon or other tool. In the bowl of a stand mixer, beat the heavy cream on medium speed until thickened and medium peaks are formed. In a medium mixing bowl, mix the cream cheese by hand, adding the sugar, lemon juice, lemon zest, vanilla and salt until smooth. Add cream cheese mixture to the heavy cream until it's fully incorporated. Add the batter evenly on top of the graham cracker crust. Refrigerate over night or for at least 6 hours. In a small saucepan whisk the cornstarch and sugar together. Add 1/2 cup of blueberries, lemon juice, lemon zest, vanilla and salt and cook over medium heat for 4-5 minutes, until thickened. Stir in the rest of the blueberries and cook for 2 more minutes. Serve over individual cheesecakes. Mixture can be stored in the fridge for a week. You mean, I have to let these set up? I’m afraid I wouldn’t even make it that far! Love a no bake dessert! I know that my daughter is going to want this recipe for her college friends. They are always looking for easy desserts to make for each other. Lemons and blueberries go so well together. I’m down with the no-bake part for the cheesecake. Then topping it with the homemade blueberry sauce is a winner! I’m so down with the no bake option! I prefer this kind of cheesecake over the baked kind and these look delicious. Wow! 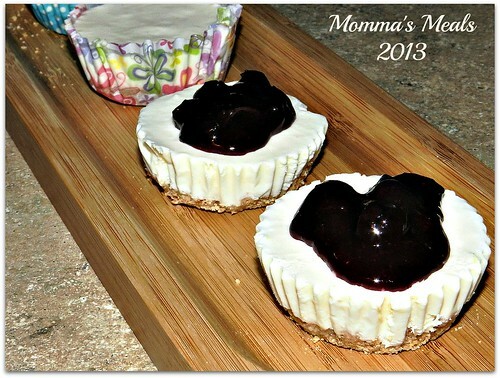 Ive never done no-bake cheesecake but this looks divine, especially with that sauce! Just love no bake desserts. And lemon with blueberry is the bomb. 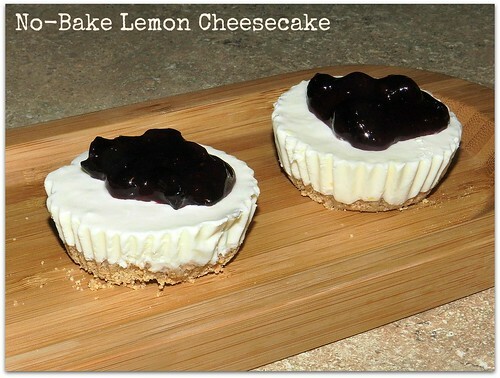 Gorgeous mini cheesecakes and I love blueberry citrus combo!! Yumm…. Oh wow this looks amazing. I am not doing very well trying to reduce my sugar intake looking at all these amazing desserts. One should always have a good no bake cheesecake recipe up their sleeves! These look fantastic, especially with the dollop of blueberry sauce over top. I’m glad you’re feeling better! Love ” no bake” and these turned out really well. Great recipe for my kids to make on their own am thinking ! !